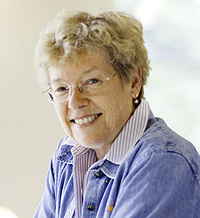 The American Astronomical Society (AAS) has awarded the 2011 Henry Norris Russell Lectureship to Sandra Faber, University Professor and chair of astronomy and astrophysics at the University of California, Santa Cruz. The Russell Lectureship, awarded annually on the basis of a lifetime of eminence in astronomical research, is one of the most prestigious awards given by the AAS. With this award, AAS is honoring Faber "for a lifetime of seminal contributions to galaxy evolution and dynamics, the distribution of the mysterious 'dark matter' in the universe, for leading the construction of astronomical instrumentation, and for mentoring future leading astronomers." Faber is the fifth UC Santa Cruz astronomer to receive this honor, following George Herbig (1975), Albert Whitford (1986), Donald Osterbrock (1991), and Robert Kraft (1995). She will give the Russell Lecture at the AAS meeting in Anchorage in June 2012. Faber is known for pioneering research on the formation and evolution of galaxies, distant galaxy clusters, and the large-scale structure of the universe. Important concepts in cosmology such as "cold dark matter" and the "Great Attractor" are direct results of work by Faber and her colleagues. She currently leads an ambitious new project (called the CANDELS Survey) using the Hubble Space Telescope to image more than 250,000 distant galaxies. A leading authority on telescopes and astronomical instrumentation, Faber has been closely involved with both Hubble and the W. M. Keck Observatory in Hawaii. She and former students led the diagnosis of the optical flaw on Hubble after it was launched. Later she led the design and construction of a powerful spectrograph for the Keck II Telescope called DEIMOS, which she and her collaborators have used to conduct large-scale surveys of distant galaxies. Faber has received many honors for her accomplishments, including the Franklin Institute's Bower Award and Prize for Achievement in Science, the Centennial Medal of Harvard University's Graduate School of Arts and Sciences, and election to the National Academy of Sciences, the American Academy of Arts and Sciences, and the American Philosophical Society. She joined the UCSC faculty in 1972 and in 1995 was made University Professor, the highest honor for faculty in the UC system. She earned a B.A. in physics from Swarthmore College and a Ph.D. in astronomy from Harvard University.